I spent the first six years of my life in Wichita Falls, Texas. You can find it outside the fence of Sheppard Air Force Base, a sneeze south of Oklahoma and up road northwest of Dallas-Fort Worth. Giant walls of dust rolled through often. The storms swept down Boren Street past my house like 18-wheelers on U.S. 287 from Henrietta or Bowie. Mothers scurried, gathering children indoors and running from room to room slamming windows shut. The houses across Boren blurred behind boiling clouds of sand and dirt. Afterward, you could feel grit dragging under your fingertips on the window sills inside. Wichita Falls was also home to box turtles. Oblivious to the civilization around them, they shrugged their yellow, olive and brown mosaic shells across streets, sidewalks and lawns, much to our delight. A few houses down from mine lived a large Catholic family. They had so many kids, their front lawn never had grass. It looked like a used bicycle lot when everyone was called in to supper. One day, we — the herd of children who played together on our block — found a turtle that hadn’t made it across the street. Its shell was cracked open. Its living spirit had escaped Wichita Falls. One of the Catholic children suggested that if we buried it in the sandbox, it would be resurrected to life in three days. I was the daughter of a disillusioned Catholic and a disillusioned Protestant. I was an ignorant heathen who had never heard of such a thing. I thought it was grand thing to try and was eager to witness it. Early on the third day, we raced over to the Catholic sandbox. We scooped and sifted for hours, arguing about where precisely we had buried it. Had it come to life and wandered away before we got there? What was the three-day rule — 72 hours after death? Or 72-hours after burial? We found neither living nor buried turtle. Apparently, a vigilant parent had stepped in to avert a crisis of faith — or the need to build a cathedral in the sandbox. That prompted my visit to the Los Angeles Pet Memorial Park. This 10-acre, landscaped park provides a resting place for more than 40,000 dogs, cats, horses and other animal companions in Calabasas. Its more famous residents include Hopalong Cassidy’s horse, Topper; Rudolph Valentino’s dog, Kabar; the Little Rascals’ dog, Pete; Lionel Barrymore’s cat, Pukie; Lauren Bacall’s dog, Droopy; and Sonny, a 9/11 hero. The palomino Smoke, owned by Victor Daniels (aka Chief Thunder Cloud), and his horse Sunny (Tonto’s horse on “The Lone Ranger”) rest in peace next to Topper. The park even includes Tawny (1918-1940), an African lion. Peaceful and well-maintained, this is a place filled with love. Wind chimes ring in the breeze. Flowers and whirly-gigs splash color under the trees. A statue of St. Francis raises his hand in blessing over a tombstone. 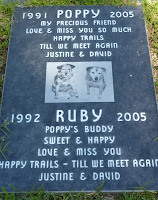 Epitaphs speak of unconditional love, loyalty and gratitude. Founded in 1928, the park is one of the oldest facilities of its kind on the West Coast. The red brick mausoleum, which opened in 1929, has lovely stained glass windows of animals. The stained glass windows and exposed brick are the result of a 2003 renovation made possible largely by a bequest from S.O.P.H.I.E member Margaret S.Carey. Niches there sell for $750 to $1,000, depending on location and lettering. The original owners, the Jones family, donated the park to the Los Angeles SPCA in 1973. The SPCA sold a portion of the land, which was turned into the light industrial park that surrounds and virtually hides the pet cemetery. In the early 1980s, they anticipated having to sell more. 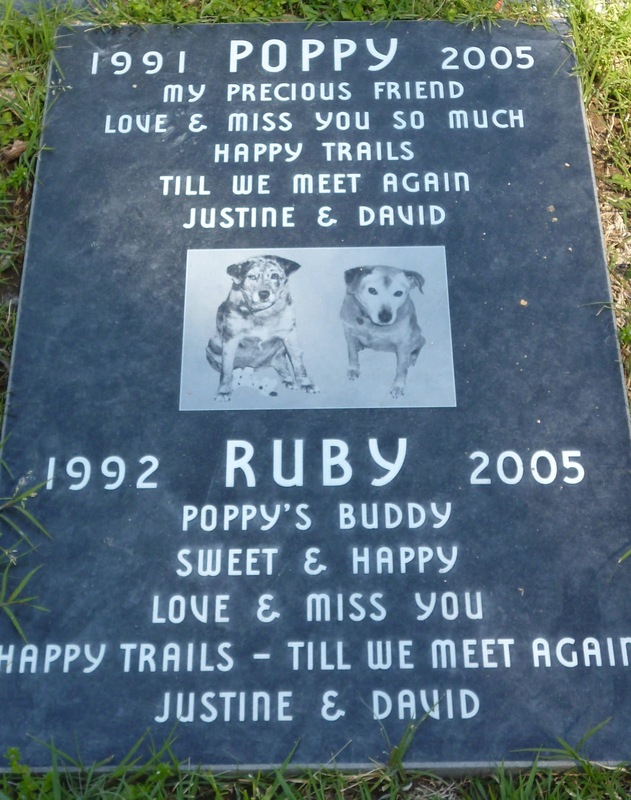 Outraged pet owners lobbied the California Legislature, which enacted the first law to protect pet cemeteries. The property was purchased by S.O.P.H.I.E (Save Our Pets History in Eternity) in 1986. Now with a solid endowment fund, the Los Angeles Pet Memorial Park has capacity to continue adding residents until at least 2030. Nearly every service you expect at a cemetery or mortuary for humans, you can find at this memorial park: burials or cremations; caskets or urns; graves or mausoleum niches; flower services; and 24-hour pick up. They have a casket showroom and a place to hold memorial services. Their website has a Pet Loss Hotline, which directs visitors to the University of California at Davis Pet Loss Support Hotline and the park maintains a list of grief counselors. The UC Davis School of Veterinary Medicine maintains a list of Pet Loss Resources on its website that is national in scope and extensive. Guardian Animal Aftercare, founded in 2001 by holistic veterinarian Audra Sykes MacCorkle provides cremation for all types of animals and compassionate aftercare for people coping with the loss of a pet. 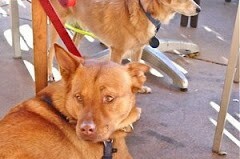 They offer free or discounted services to animals who work for the police, search and rescue teams, or has hospital therapy and disabled persons service dogs; animals owned by police, fire fighters, sheriff’s department employees, members of the military and public school teachers; and senior citizens (65 and older). Prices range from $325 for small animals and up to $1,250 for a private equine cremation. LifeGem Memorial Diamonds offers a spectacular, if pricey, memorial. It uses a small amounted of hair or cremated ashes to create a diamond in red, blue, topaz, peridot or colorless. Prices range from $2,490 to $19,999, depending on color, size and cut. Perhaps my momento vive of Joey will be a Photoshopped cigar band, laminated into a ring. In the meantime, may the feet of Time move as though glued toward that moment. 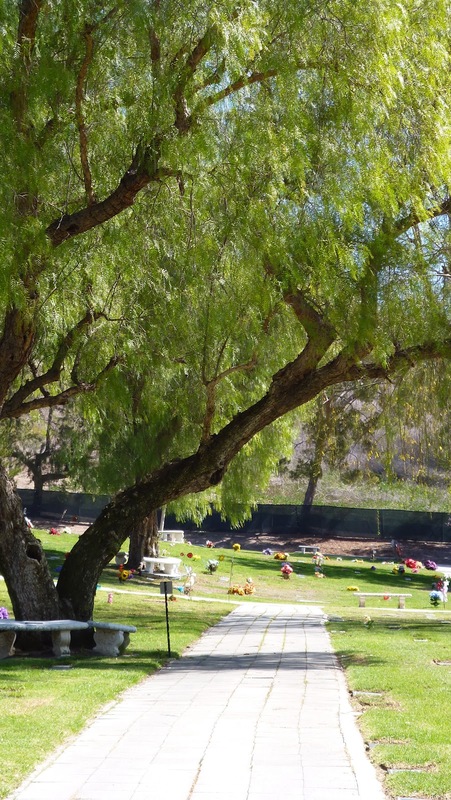 The Los Angeles Pet Memorial Park, 5068 Old Scandia Lane, Calabasas, CA 91302, is open daily. Their telephone number is (818) 591-7037.